A Funny Tasting at City Winery; SantaCon Made Locals’ Naughty ListsPlus: happy-hour deals around the city, SantaCon fallout, and more in today’s Leftovers. Slideshow: Ten Chilly Soups of SummerFrom cooling cucumber to strawberry gazpacho. Colonie Owners Bring Modernist Governor to DumboExpect chicken with farro-beer porridge and roasted pork neck with grilled peaches. 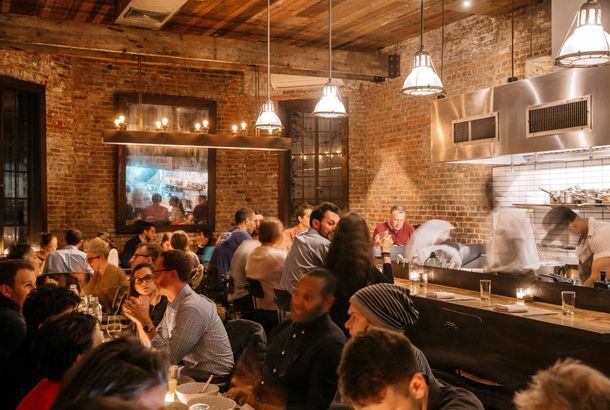 Sifton Enjoys Colonie; Cheshes Disappointed by the Astor RoomPlus: Shockey impressed by Tenpenny, and more, in our weekly roundup of restaurant reviews. Essex Street Market Opens on Sundays; South Brooklyn Pizza ExpandsPlus: Yummy Sushi replaces JC Hibachi, and more, in our regular roundup of neighborhood food news.